$16.50 Ships within 24 hours. Possible Uses of Trimox: This medicine is a penicillin antibiotic used to treat bacterial infections. 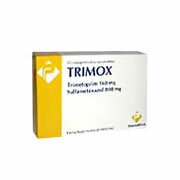 Before using Trimox: Some medicines or medical conditions may interact with this medicine. INFORM YOUR DOCTOR OR PHARMACIST of all prescription and over-the-counter medicine that you are taking. 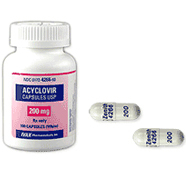 DO NOT TAKE THIS MEDICINE if you are also taking tetracycline antibiotics. ADDITIONAL MONITORING OF YOUR DOSE OR CONDITION may be needed if you are taking anticoagulants or methotrexate. Inform your doctor of any other medical conditions or allergies. Contact your doctor or pharmacist if you have any questions or concerns about taking this medicine. How to take Trimox: Follow the directions for using this medicine provided by your doctor. CHEW THOROUGHLY before swallowing. THIS MEDICINE MAY BE TAKEN on an empty stomach or with food. STORE THIS MEDICINE at room temperature, away from heat and light. TO CLEAR UP YOUR INFECTION COMPLETELY, continue taking this medicine for the full course of treatment even if you feel better in a few days. Do not miss any doses. IF YOU MISS A DOSE OF THIS MEDICINE, take it as soon as possible. If it is almost time for your next dose, skip the missed dose and go back to your regular dosing schedule. Do not take 2 doses at once. 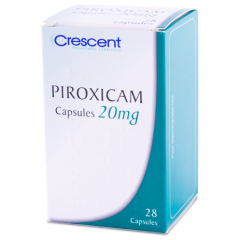 Precautions When Using Trimox: DO NOT TAKE THIS MEDICINE IF YOU HAVE HAD A SEVERE ALLERGIC REACTION to a penicillin antibiotic (such as amoxicillin, ampicillin) or a cephalosporin antibiotic (such as Ceclor, Keflex, Ceftin, Duricef). A severe reaction includes a severe rash, hives, breathing difficulties, or dizziness. If you have a question about whether you are allergic to this medicine, contact your doctor or pharmacist. 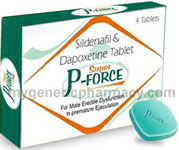 IF MODERATE TO SEVERE DIARRHEA OCCURS during or after treatment with this medicine, check with your doctor or pharmacist. Do not treat it with non-prescription (over-the-counter) medicines. IF YOU EXPERIENCE difficulty breathing or tightness of chest; swelling of eyelids, face, or lips; or develop a rash or hives, tell your doctor immediately. Do not take any more of this medicine unless your doctor tells you to do so. This medicine may cause temporary staining of the teeth. Proper brushing will usually remove this staining and may prevent it from occurring. 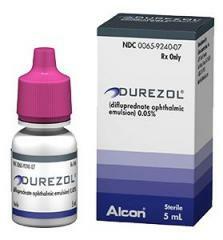 IF YOU HAVE DIABETES, this medicine may cause false test results with some urine glucose tests. Check with your doctor before you adjust the dose of your diabetes medicine or change your diet. Side Effects of Trimox: SIDE EFFECTS, that may go away during treatment, include nausea, vomiting, mild diarrhea, or irritation of mouth or throat. If they continue or are bothersome, check with your doctor. CHECK WITH YOUR DOCTOR AS SOON AS POSSIBLE if you experience vaginal irritation or discharge. AN ALLERGIC REACTION to this medicine is unlikely, but seek immediate medical attention if it occurs. Symptoms of an allergic reaction include rash, itching, swelling, dizziness, or trouble breathing. If you notice other effects not listed above, contact your doctor, nurse, or pharmacist. Overdose of Trimox: If overdose is suspected, contact your local poison control center or emergency room immediately. Symptoms of overdose may include nausea, vomiting, and diarrhea. Other Information of Trimox: If your symptoms do not improve within a few days or if they become worse, check with your doctor. DO NOT SHARE THIS MEDICINE with others for whom it was not prescribed. DO NOT USE THIS MEDICINE for other health conditions. KEEP THIS MEDICINE out of the reach of children.